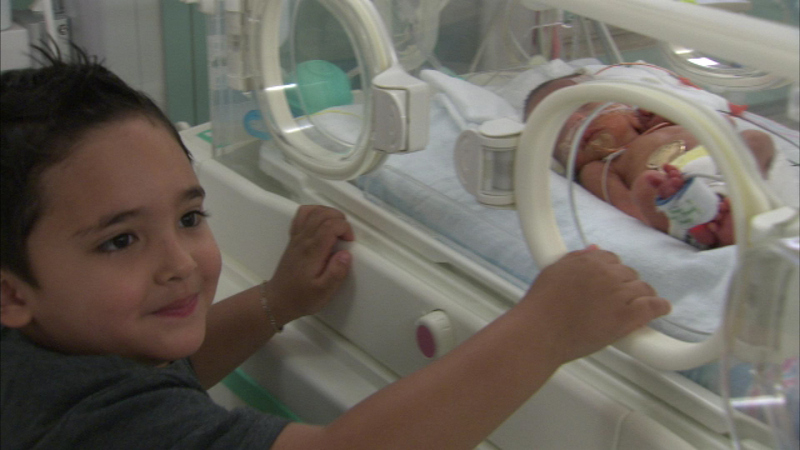 Jonathan Ramos was born several weeks early. He and his brothers were all born during years the team won the Stanley Cup: Dimaggio in 2010 and Elijah in 2013. CHICAGO (WLS) -- It's much too soon to know if he'll play hockey, but a Chicago newborn has some special connections to the Chicago Blackhawks and captain Jonathan Toews. In fact, when their mother Lenis learned she would having a boy this year, she was convinced the Hawks would win the cup. "Obviously I said it as a joke, but it came true," said Lenis Ramos. "Even the doctors here they questioned us and said, 'What do you think?' and I said, 'Don't worry about it, it's in the bag, we got it, we're going to win it,'" said Roberto Ramos, the baby's father. Jonathan was born prematurely and at home. His doctors say he's doing well and should go home in the next few weeks.